For those new to Triathlon events, these are some of the most challenging competitions out there – testing your endurance level by expecting you to compete in different races and perform well in all. This multisport race has three sporting activities that need to be completed sequentially and continuously – you need to swim, cycle and run – grueling right? Wondering about the kind of gear you should invest in for the different parts of the race? Well, considering that the activities differ, there are different kinds of equipment required for different stages. One of the essential pieces of triathlon gear is a wetsuit. Did you know that your trialthon wetsuit can save 70–80 seconds over 1,500m in just swim trunks? The number rises to 90 seconds for weaker swimmers. Why invest in a Triathlon wetsuit? How to select the perfect wetsuit? One important piece of triathlon gear is a triathlon wetsuit. This is because it not only offers speed and comfort but it also protects triathletes from cold open waters. The best triathlon wetsuits help maintain warm body temperatures, which is essential, especially if you are swimming in open water. Wetsuits with an SCS coating provide buoyancy and reduce drag through the water. This also helps accelerate swim speed. The material used in triathlon wetsuits (usually neoprene) also helps in comfortable leg movement while swimming. 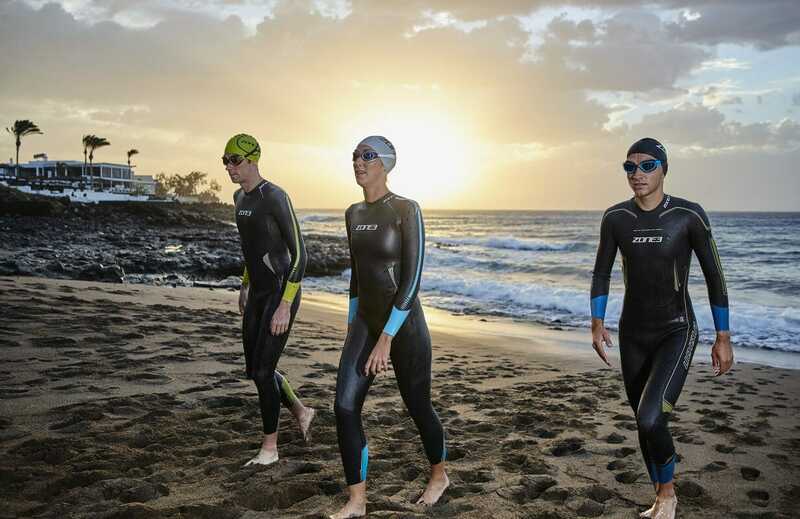 How to select the perfect Triathlon wetsuit? Fit – The most important point that needs to be kept in mind when selecting a Triathlon wetsuit is the fit. A loose fitting wetsuit will have you carrying more water while you swim, which will in turn slow you down. Look for a good fit and seal around your neck and wrist so that the water does not enter the suit. It’s always a good idea to speak to a wetsuit specialist who has vast knowledge about various brands of wetsuits, their sizing charts, how each wetsuit brand is cut and how to ensure a proper fit for your specific body type and skill. Material and Thickness – Most good Triathlon wetsuits are made with closed cell neoprene. The thickness of the material varies and can range from 1.5mm-5mm. Anything thicker than 5 mm is not legal for most triathlon races. Look for suits that offer thin and flexible material around shoulders and arms for quick movements. Usually the material around the chest and legs is thicker which helps in staying afloat in water. It is essential that you feel comfortable in your wetsuit. Many feel suffocated and uncomfortable in a tight fitting wetsuit. It can also make you feel restricted. However also remember that wetsuits must fit like a glove on your body. Loose wetsuits may cause more significant chafing and will not work properly to keep you warm, nor will they give you any speed advantage because you will be dragging the extra water filling your wetsuit with you. Most people will agree you are never really “comfortable” in a wetsuit, but you also don’t want to feel restricted inn either your arm movements or your breathing. Overall wetsuits are designed to make a person more hydrodynamic in the water – reducing the drag while swimming – thereby helping you swim faster. However the overall design, material used, paneling etc. can help you cut some time and get that marginal advantage in the race. While there are a lot of triathlon brands that offer a wide range of wetsuits in various budgets, as a general rule of thumb, the costlier wetsuits usually offer more flexibility and buoyancy. Material – Most triathlon wetsuits are made from Yamamoto rubber. This material is extremely flexible and offers buyouncy. A good majority of wetsuits also have an SCS coating to provide water resistance. Thickness – In general the thickness of the material is between 1.5mm to 5mm. The thickness is higher around chest area and thin around arms and shoulders to offer greater flexibility. The thicker the material, the more buoyancy and warmth you get from it. Paneling – Triathlon wetsuits have undergone a lot of innovation that helps in ease of breathing, better strokes and smooth transition. Such panels are usually around the shoulder and arms, chest and thighs. Zipper- As speed is an important factor in triathlons, a variety of zippers like breakaway zippers, reverse zippers, floating zip panel etc. have been invented for quick removal during triathlon transitions. You will never completely know if the wetsuit is a great fit on you until you try it in a lake. Before doing so, know that it should fit very snug on dry land. Also note most companies will not allow you to return the suit once it has been swam in, so ensure a proper fit on dry land before venturing into water. Not sure, call Just Wetsuits and they can help you better understand if there are any concerns about it’s fit before you take it for a dip. Train in the wetsuit that you wish to compete in as this helps you acclimate yourself to swimming in a wetsuit. It also helps loosen the liner of the wetsuit a little bit. from your wetsuit, and which suits you are interested in looking at so they can offer comparisons to consider. Maximum permitted thickness of neoprene by International Triathlon Union is 5mm. Most manufacturers of triathlon wetsuits know this and do not offer any suits that will create any questions about legality. Wetsuits are not legal if water temperature is above 76 degrees F (22 C). Keep in mind you can always wear a wetsuit regardless of the water temperature as long as you understand you eliminate your chances of qualifying for a podium spot or qualifying for Nationals. Weight is the MOST important factor in determining your wetsuit size. Height and chest are secondary measurments. If you do not fit neatly into a specific brand’s size chart, please call a wetsuit specialist to try and eliminate frustrations and incorrect orders. If you are between sizes or within a few pounds from the top of a size’s range, always go for one size up while choosing your wetsuit. Wetsuits with sleeveless arms are easier to get out of a suit quickly, but sleeves mean more warmth, more rubber and therefore more buoyancy. If you are wondering whether a full sleeve or sleeveless wetsuit is for you, call a wetsuit specialist to discuss the pros and cons specifically for you and your body. After you train in the wetsuit, always rinse it with fresh water and hang it over the top of a shower rod or tub INSIDE OUT and let it drip dry. Also consider washing your wetsuit in a small basin with some wetsuit specific shampoo about every 5-10 wears to clean it and eliminate odors. Wetsuit choices largely depend on personal preference and the kind of product you are looking for. If there are no budget constraints pick the one that offers maximum comfort and better hydrodynamics. Just remember, it’s important to know the weather conditions of the place where you will be competing and choose a wetsuit accordingly.